Try as they might, the organizers just couldn't get the management people to let us into the "modern block" buildings. But a much larger than expected group of hardy building buffs showed up for TulsaNow's inaugural Tulsa Treasures Tour this morning. We counted more than 70 at one point, a hefty turnout considering the morning temperatures were in the twenties. 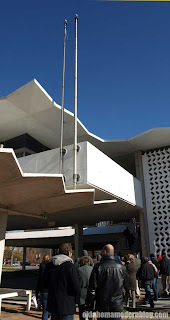 The four buildings on the tour included two Art Deco gems and two modern postwar buildings. Sarah Kobos emceed the tour with Rex Ball, who provided outstanding play-by-play highlights of each building on the tour- and a few others. Before we ventured out, Amanda DeCort from the Tulsa Preservation Commission, offered a brief summary of the recently completed Downtown Tulsa Architectural Survey. Unfortunately we didn't get to go inside the two modern buildings, the First National Autobank (now labeled Chase) or the Ponca City Savings & Loan (last occupied by Smith Abstract). But we still enjoyed seeing them, and it's good to know that so many other Tulsans want to see them too. Both of these uninhabited structures are marvelous examples of Mid-Century Modern, and high on our endangered list. Look for more activity regarding this block of downtown in the coming year. The buildings we did tour were the Oklahoma Natural Gas building and the ARCO Building, aka Service Pipeline Building. ONG is classic Art Deco from 1928, while the ARCO design is a very late example from 1949. Built the same year as Tulsa's first modern skyscraper, the First National Bank tower. 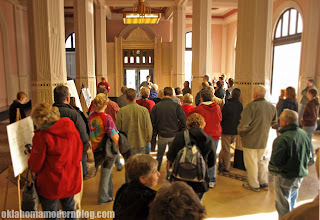 We've posted more photos from the event- Tulsa Treasures Tour.